What a strange incestuous fashion blogging circle I write and exist in. 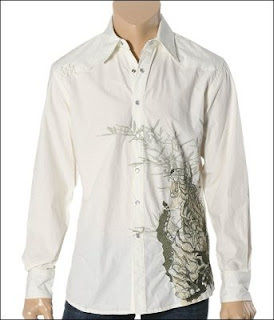 Yesterday afternoon a guy friend told me he wanted to find a dress shirt that was a bit on the casual side, appropriate for clubbing or an evening out, and preferably with some standout detailing to make it unique. Little did I know he'd broached the same question with my friend mizzj over at Being High Maintenance, Not Bitchy, who put together this great post of her top picks and tips for choosing an appropriate shirt. Her picks are classic and versatile, but I instantly gravitated toward shirts that had a little more attitude and edge, browsing for versions that had screened designs, distressing, embroidery, embellishments, etc. 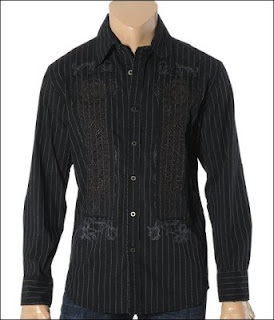 on sites like Parasuco Denim Cult, Mavi, Rock and Republic, and Buffalo. My search took me to Roar Clothing USA, a brand which isn't as notorious but should be because they have awesome men's casual button-down shirts. As David Kogan, the CEO of eModa.com, says on the Roar website, Roar has the type of highly detailed men's shirt that could retail for upwards of $200 but actually sells for $90 or less. 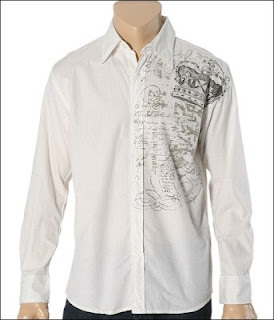 These were my favourite Roar men's shirts. Enjoy! lol we shall see! The sad thing about Roar is I don't know if it's available in Canada.